Dr. Bruce Clarke, Rutgers University turfgrass pathologist, has reported that approximately 70% of all fungicides used on golf courses are to control the turf diseases dollar spot and brown patch. Understanding the importance of developing improved bentgrass varieties Dr. Stacy Bonos, Rutgers University turfgrass breeder, has been researching and breeding bentgrasses since the mid 1990's for improved disease resistance. One of the imporved bentgrass varieties released from this program is 007 bentgrass. Golf course superintendents who have renovated and regrassed their courses are reporting savings up to 50% on fungicide sprays with 007 bent greens, tees and fairways. Superintendent comparisons are between the older bentgrass varieties or a mixed stand of Poa annua, ryegrass, and old bents that existed on their golf course before renovation and regrassing to 007. 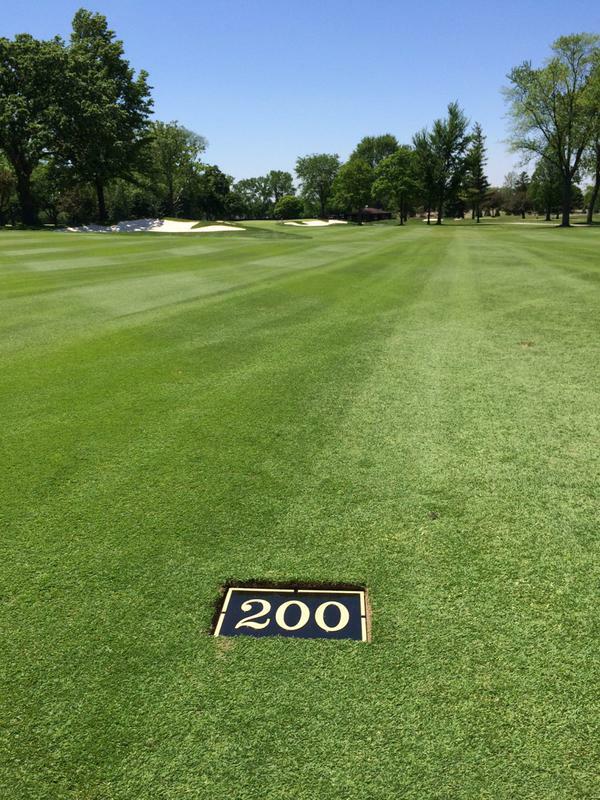 Ridgemoor Country Club, total course renovation, Summer / Fall 2014. Evaluating this eleven month old 007 turf: Going into August 2015 Josh Langell, Superintendent, reported he has cut fungicide use approximately 50% with 007 seeded on greens, tees, and fairways compared with what he was using prior to the total course renovation. Those saving on fungicides are real and will continue month after month and year after year. The River Bend Club, Great Falls Virginia, underwent a total course renovation and regrassing in 2010. After five years of maintaining 007 bentgrass, golf course superintendent, Tom Lipscomb reports significant fungicide savings to control dollar spot and brown patch comparing his new 007 bentgrass greens, fairways and tees to the old prerenovation mixed bent / Poa annua greens and a stand of bents, Poa annua and ryegrass on tees and fairways. Photo below - November 10, 2010 - is the par five 9th hole at River Bend. Fairways sodded in late summer 2010 using 100% 007 creeping bentgrass. A golf course in Chicago, Cleveland, Detriot, Philadelphia, Washington DC, or New York has greens, fairways and tees consisting of old bents or a mixed stand of bent / Poa annua greens and a mix of bents, Poa annua and ryegrass on tees and fairways. Using the above geographic regions as examples golf courses located in these areas commonly have a history of requiring approximately six months of fungicide applications, from May through October. A total of twelve to eighteen fungicide applications per season would be required to control dollar spot, brown patch and or pythium on a golf course in any one of the above locations. The total budget for fungicides typically would be in the range of $80,000 to $120,000 per year. By comparison there are golf courses that have seeded / renovated greens, fairways and tees to 007 bentgrass which now benifit by reducing fungicide applications 25 to 50% for control of dollar spot and brown patch. A 50% reduction in fungicide purchases means real financial savings of $30,000 to $50,000 each year that would equate to up to $500,000 over a ten year period. Photo above: Ridgemoor Country Club with new 007 bentgrass fairways.